Posted by Anton Veigas & filed under Blog. As one would expect, there are a lot of regulations surrounding egress and stairwell signs. Signs are required for interior exit stairways that connect more than three stories. 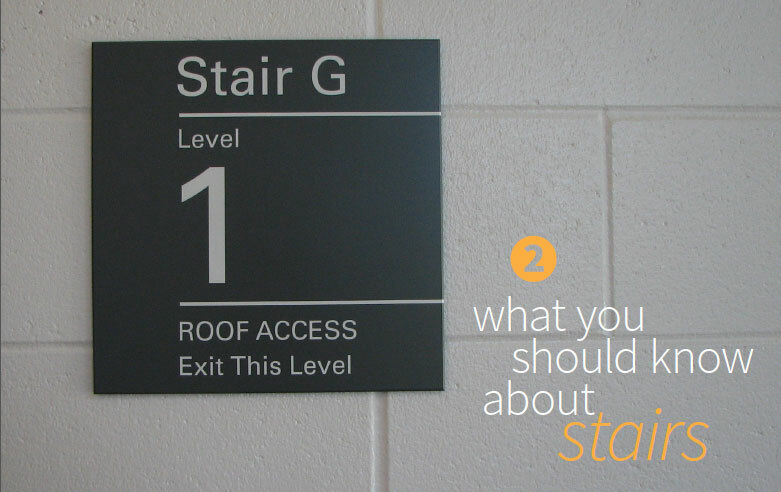 In general, monumental staircases do not require signage, although they can often benefit from a directional sign. Stair identification sign in corridor. This is a tactile and Braille sign next to the door leading into the stairwell and provides stair identification. If there is more than one stairwell in your building, the stairs are usually given letter identifications to differentiate them from floors. A separate requirement calls for a sign identifying doors to exit stairwells. So, a typical message on this sign is “EXIT STAIR A”. Stair/Level identification within the stairwell. This is a tactile and Braille sign next to the door leading out of the stairwell and provides level identification. A typical message on this sign is “LEVEL 2”. Stair Landing Identification. These are signs for use by emergency personnel and building occupants during an emergency. These signs are large with large type, and provide stair and level information, as well as indicate where and in which direction to find the emergency exit (since, in some instances, the way out requires a user to go up the stairs). This sign also indicated the range of floors served and the availability of roof access. One other stair related requirement that you may encounter is the need for photoluminescent signs within the stairwell. Codes will require that “high-rise” buildings include “glow-in-the-dark” stair landing signs under certain conditions. The need for these signs is dependent on the occupancy classification (A,B,E,I,M,R-1) – a typical application is for hotel towers. Whenever luminous egress path markings are required, a photoluminescent Stair Landing Identification sign is required as well.